The race directors of the Tahoe Rim Trail (TRT) Endurance Runs generously hosted two days of group training runs on the TRT course this past weekend. The Saturday run featured the far-end of the 50-mile/100-mile race course at Diamond Peak Ski Resort, including the infamous Red House Loop, for 20+ miles on trail. The Sunday run traversed the start and finish of the race course on the Spooner Lake side, with an option to include the Red House Loop for 32+ miles or 26+ miles without. This annual training event is open to all trail runners, even if you are not registered to run the race. Registration for the training runs is still required, along with a nominal $10 fee. Race organizers provide an aid station at Tunnel Creek and a meal at the finish complete with cold beverages. You also have the fun of meeting other runners in an environment more relaxed than even a typical trail race. This was my first time at the group training run, and it was just such a great, friendly, relaxed environment. My husband and I joined the group on Sunday (minus the Red House Loop) in preparation for the 50k race. I was so inspired by all the runners who trained both days, putting in a double-long-run weekend that should be fantastic preparation for their longer race distances. I even find myself thinking that a 50-miler could be in my future. Sunday morning started with some of us not quite sure of the start location. I read on the website that the start would be at the “North TRT trailhead, US50 at Spooner Summit,” but I wasn’t sure that I entirely trusted this information. The actual race starts inside Spooner Lake Park. We pulled into the park to use the restroom in any case. We decided to pay the $10 park fee, as this is really one of our favorite areas and we are happy to donate a few dollars to keep the toilets flushing. With a little help from some other runners, we finally confirmed that the start would, indeed, be outside the park at the TRT trailhead. 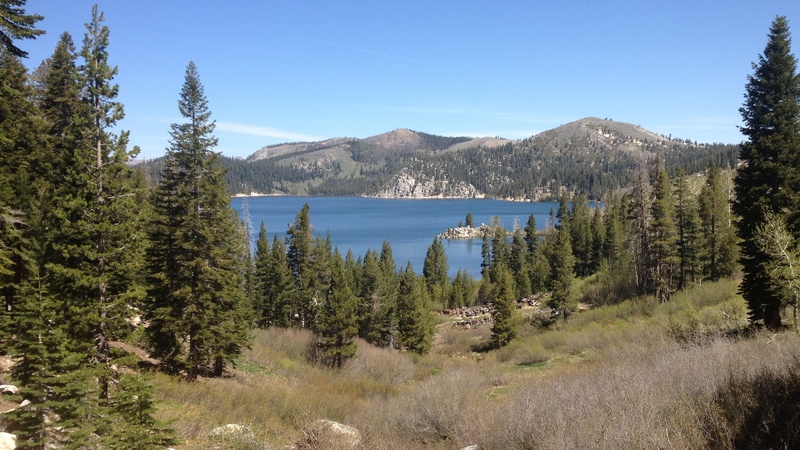 Click here for a map of the Spooner Summit Tahoe Rim Trail (TRT) parking areas. It turns out that there is also a restroom outside the park on the south side of US 50. We drove out of the park and scurried to the pre-run briefing. I think it’s important to point out that trail runners need to take considerable responsibility in understanding a race course (or, in this case, the training course). While the organizers did mark the course with chalk, the markings were more of a guide for those who already have a general familiarity with the course milestones. As local ultrarunner Peter Fain pointed out in this article last year, knowing and staying on course are fundamental skills of trail racing. Sunday’s course was complicated by the fact that there would be no aid station at Hobart, as described on the event web page. Instead, there was an alternate route choice of stopping by the Marlette Peak Campground for fresh, cold well water. The campground route goes off the actual race course, but it was a delightful discovery to find that wonderful, cold, potable water tucked away in the backcountry. 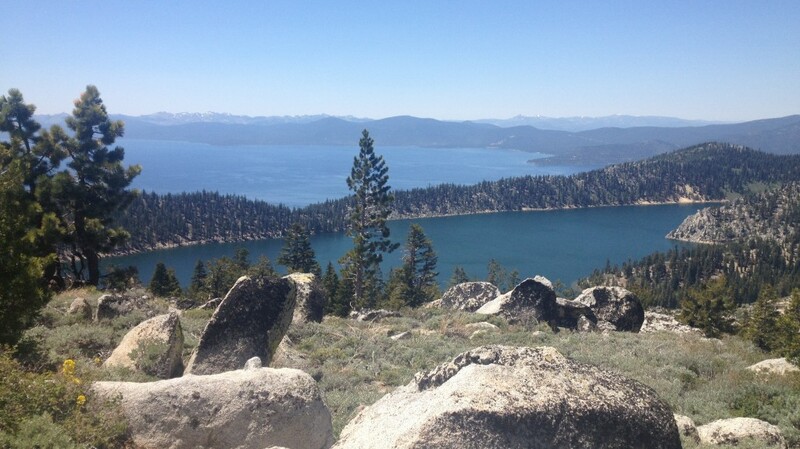 You trade off some great views of Lake Tahoe for this water stop, but there are plenty of other spectacular views of the Lake from other parts of the trail. After the campground diversion comes one of my favorite parts of the 50k course – the cruise down from Marlette Peak and on to the Tunnel Creek aid station. Unfortunately, this is the point at which my husband complained of calf pain. I was hoping it was a cramp that he could work out, but alas, as he “ran” into Tunnel Creek, I started to suspect something worse. We enjoyed a fine spread at the aid station while my husband rested a bit. The aid station was also the turn-around point for the training run, and I watched my husband cringe with pain on every step as we headed away from Tunnel Creek. After about 10 minutes, it was clear to me that he would be unable to complete the 14-mile return. He hobbled back to the aid station where we discussed options with Dan, the friendly volunteer. Ultimately my husband decided to walk 4 miles down Tunnel Creek Rd. to Highway 28, where I would pick him up on my way home. It turned out to be a very slow and painful hike for him, but he made it down in about the same time that I traversed the 14 miles back to Spooner Summit. Bummed as I was for my hubby, as he had a tough day and is most likely out of the running for the 50k race, there were some up-sides for me. First, I spent at least 45 minutes basically resting – walking or standing around at the aid station, as we worked through the problem. Second, I crossed paths with and met many friendly runners as I bounced back and forth around the aid station. And, by lucky coincidence, I was able to tag-along with two (much) faster runners who had already been down and back from the Red House Loop. I was able to hang with these guys for about 5 miles and I really appreciated the company! I hiked up the Tahoe Rim Trail to Snow Valley Peak alone on the windy ridge. Normally wind really annoys me, but for some reason I was finding it mystical and interesting up there on the ridge. As the trail passes over the ridge to the Lake Tahoe side, I found it difficult to put my camera away. The view of Marlette Lake perched high above Lake Tahoe is my favorite of the entire run. The descent from Snow Valley Peak back to Spooner Summit is nothing short of delightful when you haven’t already travelled 20 miles on foot. The trail is mostly smooth crushed granite with views of Lake Tahoe in the foreground and Desolation Wilderness beyond. However, after a full day on the trail it can seem like the trail will never end, and each short uphills makes a convenient excuses to slow to a hike. Thanks to my long rest at Tunnel Creek, I was able to cruise down the descent with only a couple of hiking breaks. I was greeted at the finish by the race director cooking burgers and dogs and a cooler full of ice-cold beverages. I checked in with the registrar to let her know that I returned safely, and by that time was able to report that my husband was also accounted for at the Flume Trail Shuttle stop on Highway 28. I finished the day thinking that I enjoyed it more than the actual 50k race last year, and wondering how I can retain that feeling of relaxation for race day this year. I really appreciate the race organizers’ efforts in putting together this event (basically for free) and also all of the friendly runners who participated. If running an ultra seems out of reach for you, then I recommend that you try one of these training runs next year… but watch out, because you just might catch the bug! Hi Helen, I did the Saturday run, I wanted to face the dreaded, at least for me, Red House loop. I ran down fast this time, like last year, but since I had done it last year, it seemed easier this time, maybe also because there were so few people I didn’t have to worry about running into anyone. My legs felt good at the bottom. The first two times I had done it, I braked too much and my quads were beat up, had to walk most of the rest of the Red House loop. As I went down it, a woman was already coming out, 6.5 miles ahead of me after I had gone 5 miles. Very fast, she was saying she saw a big bear at the bottom, must have scared it, no one else did, there was a huge bear trap by the Red House where the aid station normally was. It was also interesting to see the other part of the trail that the 50 and 100 milers do. It started from the ski lodge at Diamond Peak, went straight up 2 miles to the top of the highest chair lift. Coming back, it passed, the lift, went up higher for a ways, then down a reasonably not too steep mountain bike trail back to the lodge. I thought it would be a 20 mile run, it ended up being 23 miles. It was good training, for hills, miles and heat. My longest run was 19.5 so far.. I wouldn’t want to do the 50 mile and have to do that ski run uphill again, or the 100 and have to do it twice. 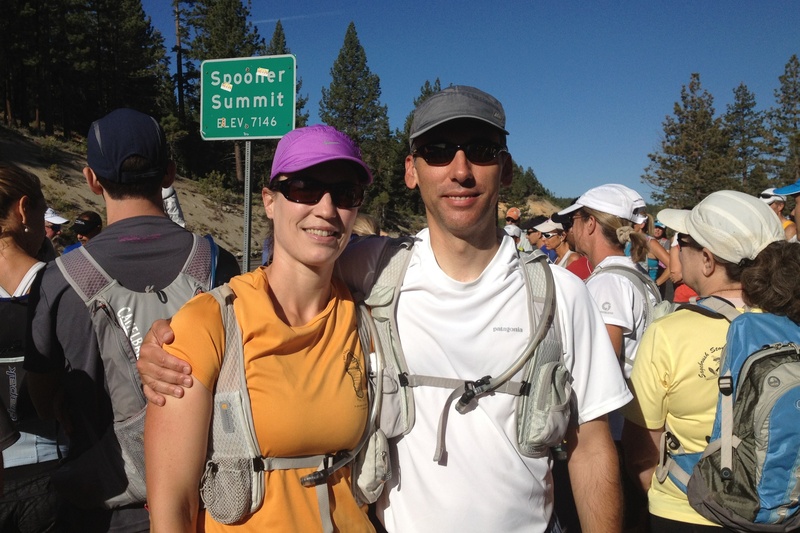 Cheryl Lloyd was running it, saw her often along the way, only because she waited longer at the aid station. She emailed me that she did 27 miles 2 days later, she is doing the 50 miler. I had a bandana and got it wet often, got ice and put it in at the aid stop, and got snow from the one tiny patch in the last 6 miles. It was very warm, I hope it isn’t too hot that day, I only did better last year since it was the high was 15 degrees cooler that the previous 2 times I had done it, but maybe training in the heat more will help. The problem with being wet when it melted, was the chaffing around my arms, need to wear a sleeveless top and use lots of glide. Thanks so much for the update! Do you agree that Spooner Lake side of the runs is overall more scenic than the Diamond Peak side? I want to do both training runs next year! Yes, every agrees that their GPS watches show the distances 5-10% longer than advertised on both the training runs and the actual race. Not sure how much of this is GPS error (very likely) and how much is measurement error of the course (some is certainly possible). That’s trail racing for you, huh?!?! The Spooner Lake side is more scenic, I can say that now that I have seen both.